CHARLOTTE, N.C., Feb. 5, 2019 /PRNewswire/ -- Today, Belk announced a $1 million partnership with Family Promise to empower mothers and help families thrive. The contribution is part of the retailer's community outreach program, Belk: Project Hometown, in support of their mission to strengthen southern communities. Belk is also asking their customers to share their love of community with Family Promise this Valentine's shopping season by donating at the register now through March 2nd. 1 in 6 U.S. children live in poverty and Family Promise is fighting this issue by working with parents and their children to provide the tools they need to sustain independent housing. 60 percent of the individuals Family Promise serves each year are children and most of the households served are led by single mothers. "Every child deserves a home, so we're proud to partner with Family Promise as they work to keep families together when times get tough," said Lisa Harper, Belk CEO. 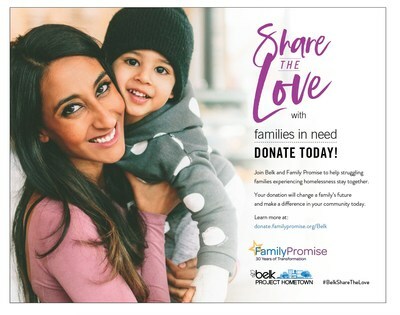 "This year, Belk is launching a campaign to share the love with friends, family and local communities, and Family Promise is the first of several national partners to receive donations. We hope this contribution inspires our customers to get involved, and together, we will impact the lives of neighbors in our communities and beyond." "We are thrilled to be part of Belk's commitment to its hometown communities. By partnering with Family Promise, Belk will change the lives of thousands of southern families. Our shared commitment to women, children, and community engagement makes us a natural fit. Together, we can end family homelessness in the region," said Claas Ehlers, Family Promise CEO. Belk, Inc., a private department store company based in Charlotte, N.C., is where Southern customers shop for their Saturday night outfit, the perfect Sunday dress, and where family and community matter most. But Belk is more than shopping – it's where you find your own unique way to express who you are. It's where Southern style lives. Shop Belk in 16 Southern states and www.belk.com to find an assortment of national brands and private-label fashion, shoes and accessories for the entire family, along with top-name cosmetics, a wedding registry and Southern style for the home. Check out the Belk Newsroom to see the retailer in action as they give back to the community, deliver fashion-forward trends and more! Family Promise is the leading nonprofit addressing the issue of family homelessness, with more than 200 affiliates in 43 states. Through a comprehensive set of solutions involving prevention, shelter, and stabilization, Family Promise empowers families experiencing homelessness and at-risk families to reclaim and maintain their independence. Since their inception, Family Promise has served 825,000 people, the majority of them children. On average, 82 percent of the families served secure housing within nine weeks of entering the program. Family Promise has received a four-star rating from Charity Navigator, their highest rating, for five consecutive years, an honor attained by only 9 percent of nonprofits nationwide.